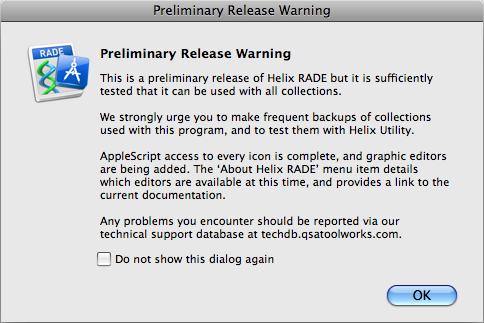 10 June 2013 — We are very pleased and proud to announce that Helix RADE Preliminary Release 24 is not shipping today. Now that we have your attention, the reason Preliminary Release 24 is not shipping today is simple: the “Preliminaries” are over. Today’s release is called, quite simply: Helix RADE 6.2. Today, Europa Pioneers get a copy of Helix RADE that will not run in Classic, will not run on PowerPC Macs and will not expire. Our June 10th Adventure has arrived at its intended destination, ready to move forward. There are now no strings, no caveats. As of today, neither AppleScript nor Classic are needed to do Helix collection design. Classic is history, and we’re happy to put that behind us. And as the Helix product family moves forward, the AppleScript integration will actually become more and more useful to those looking to work even more efficiently. But today’s big announcement is that Helix RADE’s graphic user interface is finally complete and our long-awaited future can now begin. From today forward, you will no longer be seeing either of the dialogs shown at right. They are presented here one last time out of sheer nostalgia — certainly not out of any need to fill space! Two years ago we started the Europa Pioneer Plan and gave you a first look at Helix RADE running in macOS. And so, for the last two years, the first dialog shown on the right would appear whenever you launched Helix RADE and the second one would appear whenever you double-clicked an icon in RADE. Month by month we added new functionality until now, finally, mercifully, these dialogs are history. Before we go on to describe the latest improvements — including the now-complete user editor — we should mention that you can find all the details of what has changed since Preliminary Release 23 in the Helix RADE 6.2 Release Notes. At some point, we hope to be able to pull all of the release notes together into one place, but that’s a project that has to wait for a few other more pressing items to be resolved. Stay tuned. Why is the User icon such a big deal? In spite of its prominent location in the Element Panel (shown at left, as seen when the Collection window is frontmost), a significant number of RADE users have never dragged a user icon into the workspace. When you use Helix as a single user, it is easy to both design and employ your collections at the same time, working exclusively in Design Mode, obviating any real need to go into User Mode. Early Helix users designed collections much the way so-called “apps” are designed today: with a very specific and narrow focus. More collections with fewer functions. But more ambitious and adventurous souls soon realized that with a fully relational database back end, they could use Helix RADE to design a system that did everything they needed in a completely integrated manner without duplication of effort. Furthermore, with the ability to create menus for users, end-users could be kept out of Design Mode altogether. Instead of having to hunt through numerous icons to find what they needed to work, they could simply select it from a menu, or a click a button on a nice navigator bar. And if that wasn’t enough, once they had created a menu for a user, that user could access their data anywhere from a single desk to anywhere on the planet. And if that still wasn’t enough, they could even share their data. Now, there are two ways to share your information with other users. One is simple, logical and elegant. The other is ridiculously, needlessly complicated; but since it is less expensive, it is a road too often taken. In this scenario, there are multiple copies of a Helix collection used by different people on their own machines. At the end of the day, or the week, or whatever interval is most convenient, someone is charged with the responsibility of merging the data changes from all the copies into one and then beginning the cycle again by giving each user a new copy. There are several ways to do this, but all of them are cumbersome and frought with the constant threat of significant data loss. The simple, logical and elegant alternative is the Helix Client/Server toolkit. It opens the collection you built and edited in RADE and allows more than one user to access and edit the data simultaneously, or even the same individual user to access it from multiple locations. There is no need to merge at the end of a day, a week or ever. Everything is always in the same place. But in order to use Helix in Client/Server, you must drag out, double-click and configure the aforementioned user icon, one for each person who will be participating in the workgroup. And that brings us back to today’s release. Beyond the mere benefit of better organization, the Helix “user,” when used in conjunction with a “user globals” relation and the “User” abacus tile, unlocks the true power of the relational database and allows you to search through oceans of data easier, faster and more efficiently than the common way, scrolling through long and cumbersome lists. Using the user icon this way doesn’t just provide these benefits for local or widespread workgroups; it also benefits users of RADE working by themselves. 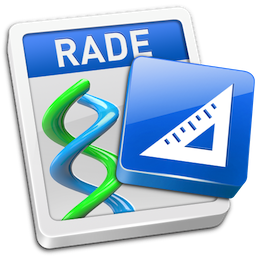 The user icon then, is not just the final piece of the development puzzle for RADE 6.2. 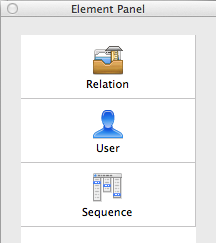 The user icon is the centerpiece of proper Helix application design. OK, enough philosophy. Let’s take a look at how the user editor actually works in Helix RADE 6.2. Although the Release Notes describe the new features in detail, this video provides a quick tour of the major new features of the user editor. If you ever had to maintain a large collection with the Classic user editor, one look at what we’ve done should have you dancing with joy. Looking at Helix is sometimes like looking at an onion in reverse; instead of peeling the layers back to reveal the essence, Helix essentially begins at its essence and swathes it in successive layers of integrated functionality. Each time we stand back and marvel at what it does, the latest capabilities enable us to look further down the road at what it might yet become capable of doing. This is also a very thinly veiled way of saying that the job is never done, that there is always more we can do and that, in the case of most software, the release is only a phase of testing that extends to a broader audience. Someone out there who has not yet seen Helix RADE 6.2 will undoubtedly look at it in a way it has not yet been looked at and will find something we may have missed, or something we wish we had done differently. As such, it should be no mystery that before there will ever be a Helix 6.3, there will be at least one maintenance release of Helix 6.2. Helix 5.3 had three. Helix 6.0 had three, and Helix 6.1 had eleven. Exactly when that might happen is anybody’s guess at this point, there is one thing that can be said about the inevitable Helix RADE 6.2.1 today: Any Helix RADE 6.2 licensee will get 6.2.1 — and any successive maintenance releases — at no additional charge. Even though we tend to think of Helix as a single tool that lets its users manage and share information, Helix really is made up of four discreet programs: Helix RADE, Helix Engine, Helix Server and Helix Client. In our headlong rush to complete Helix RADE 6.2 it may have seemed as though we have been neglecting the other three. While they most definitely have been on the back burner in the recent past, rest assured that they are not forgotten and that the debut of Helix Client/Server 6.2 (and Helix Engine 6.2) is not that far away. Helix has always been a work in progress, and today’s release of RADE 6.2 is no exception. It is a significant milestone primarily because it marks the end of our support for both Classic and the PowerPC platform. But what lies beyond 6.2? All through the process of making Helix products run natively in macOS, we have kept notes about things we planned to do, future layers of the proverbial onion to wrap around 6.2. There’s always a temptation to add these features as you go, but that would not have been in keeping with our modus operandus, which has always been to build solid foundations and add bells and whistles later. Helix RADE 6.2 is loaded with new features, in addition to running in macOS, but those are mostly evolutionary new features that “came with the territory” of getting to macOS. Here we’re talking about major extensions to existing features, as well as some completely new ideas. That next version, which we are currently calling Helix 6.3 for lack of a better title, is already taking form. Some of its capabilities are already known, specified and ready for development. To keep things pointed in the right direction, we believe it is critical to constantly re-evaluate our thinking, not to let ourselves be guided by ideas or plans that are no longer relevant or as worthwhile as they might once have been. When confronted with a new landscape, surveyors always set up their transits and theodolites. As the debut of Helix RADE 6.2 represents such a new landscape, we will be conducting a handful of surveys in the months to come to get your input on everything from how to sell Helix to what should go into it. If you can remember all the way back to the so-called “good old days,” you will also remember that before this monumental undertaking began, new Helix was always about new features and new capabilities. But for several years now, we have held the line against the encroachment of the feature seekers to focus on getting past our big Classic obstacle. Many years ago, in a galaxy far, far away, the original “Helix Feature Game” was played, with Helix users participating via email. To kick off this new round of product development, we plan to resurrect the feature game, but this time, it will be on our website as an interactive survey. You will be presented with a list of features people have requested for Helix and asked to prioritize them, budget them and schedule them, at least in terms of what should come first, next and so on. To prepare yourself for this exercise, we urge you to take some time and start to familiarize yourself with the different ways things work now. If you don’t have a copy of Helix RADE 6.2, of course, this means you will have to purchase one. Once you’ve had a chance to do that for a little while, a great place for you to visit is the features section of our online database techdb, especially to have a look at the list of 85 original feature requests and those that have been added since then. If you’ve never accessed techdb before, complete instructions are found here. While you wander around in the database, you might feel like entering new feature requests. If you do, the one thing we ask is that you bear the following statement in mind: no two witnesses to an accident ever see the same thing. Over the years, many users have requested the same feature using very different words and phrases. We have done our best to condense those into single entities, keeping the number of actual feature requests more, shall we say, “real?” It’s always a good idea to see if your umbrella is in the closet before buying a new one. Similarly, we suggest you search for your feature before just entering it. Chances are pretty good that someone has already asked for what you want. Should you find such a request, please add any comments you might have to the record. The more input we get on a feature people want, the more likely it is to become a part of Helix. When we began work on RADE, we promised those who helped underwrite its development that they would pay the lowest price; that whatever it ended up costing at $20 per month, those who came after them would pay more. Now that we have come full circle at last, it has taken between $400 (from those who paid each year in full up front) and $480.00 for those who chose to pay $20/month. Since the subscription program ended a couple of months ago, a few Helix users have expressed a desire to buy Helix RADE 6.2, but professed an inability to afford the $480.00 ‘pioneer buy-in’ price. Times have not been easy. We know this only too well. Many who have held out have wisely pointed out that to keep our promise, the price we would have to charge might have the effect of discouraging people from purchasing a copy. We’re also only too well aware of that. Of course the real cost of bringing RADE to macOS was much greater than $20 per month multiplied by the number of users who participated. But a promise is a promise and we always striven to fulfill our promises. This will be no exception, even if what we’re about to say might seem like a stretch to get there. So what is the middle ground? How do we reward those who supported this effort without turning away potential users? Here’s how: Helix users who were part of the Europa Pioneer Plan will get Helix 6.3 at no charge. If you are just now upgrading or purchasing a new license, the combined cost to get to Helix RADE 6.3 will be higher than that paid by Europa Pioneers. The chart shown on the right illustrates one way this might happen. Please note that in our zeal to reach this sentimental release date, we deferred a number of important things we usually do in preparation for release. One of those is readying our web store for upgrade sales. It is going to take us a few weeks to get that work in place and tested, so until we announce that the web store is ready to sell upgrades, the only way to get Helix RADE 6.2 at upgrade pricing today is to call Gil at 800-784-7018 (or 516-935-9151). Please be patient; all calls will be returned. Of course there is a little loophole whereby you can still save money. Until we have updated our web store to support Helix 6.2 sales, you can still join Europa Pioneer Plan for $480.00. That entitles you to the free Helix RADE 6.3 upgrade, saving a few dollars in the process. Finally, if you were among the thirty-four Europa Pioneers who, for one reason or another, dropped out along the way, now that we are here, we want to give you the opportunity to catch up. Call us and we’ll get you up to date for the difference between what you paid and the price for a new purchase. A little while back, an overly cautious user of Helix Client/Server called to inquire about our progress and casually mentioned that she looked at the macOS Client/Server when it first came out and found it unusable so she never looked again. Now, with PowerPC machines dropping dead left and right, she was forced to consider it again, but her initial experience left her full of fear. Are first impressions the only ones? We put our first macOS Server out in December of 2005. That is now more than seven years ago. Yes, our initial passes at Helix Client and Helix Engine were a bit terrifying. But they evolved into solid and reliable tools that serve Helix users every day. Today, there are hundreds of Europa pioneers scattered across the globe. They have stuck with it, helping us adapt and refine RADE to the point where it can safely be used anywhere. Not only did we bring Helix RADE to macOS, we also fixed numerous bugs that have existed in RADE for a long, long time; some for decades. Helix RADE 6.2 is not only the first Helix development tool that runs natively in macOS. It is also the best Helix RADE there has ever been. If you are like this person, having looked once and never looked again, you may be in for some shocks. If you have stayed so far away that you have not even kept up with the news as we have gone along, then you are going to see a Helix RADE that is much different than what you remember. But as you begin to use it, you’re also going to see a Helix RADE that is much better than what you remember. In the future, there will once again be a new Helix Reference, new Helix training, a new Helix Developer Program and, as they say in advertising, much, much more. With all that, and between the Helix Recovery Team and the dedicated Helix professionals included among the Europa Pioneers, there’s a strong safety net beneath you as you take your Helix applications into the 21st Century with confidence. If you are thinking, at last, of coming back, know that we welcome you back with love and brotherhood. As a Helix user, you are different. You are not a blind follower of fashion and trends. No matter how far you may have strayed, your family misses you. Come home. And finally, our deepest and warmest thanks to those who came along for the ride. You have participated in something wonderful. All these world are now ours. Let’s play!